“I’m Taco Kind of Gal” pattern was created for a popular textile/patter design company “Spoonflower” weekly design competition! Every week there is a different pattern design competition on a website called Spoonflower and once you’ve entered your design into the competition people will then vote for their favourite design. The prizes vary! The first place winner will receive $200 Spoondollars which means you can spend this money to purchase fabrics, wrapping paper and more on their website. It’s a bit of a long story how I found this competition. I have to admit I don’t visit Spoonflower’s contest website very often because I’m always too busy with work and family but my dear art collective colleague Sarah told me there’s a food colouring sheet competition on Spoonflower and asked me to enter the competition. I went on the website, read through the information on the colouring sheet competition but found out the deadline was only 2 days away which was impossible. My daughter was home at the time on school holiday’s and those few days we didn’t have her booked in for any holiday camp so I sadly had to give up on the colouring sheet competition. But that’s not the only competition they do and I found they were also running a competition called “Taco & Burritos”. The idea behind this competition is to create a pattern and use tacos and burritos, or even just one of them for inspiration. I love drawing food as you know and I’m desperate to expand my pattern portfolio, so I immediately decided I’m gong to create something to enter this competition. I’m not really a burritos fan but I do love tacos and that’s how I got my inspiration. I like deciding my colour palette and colour themes before I start new work so I searched for Mexican wall art, Mexican paintings and furnitures for my colour palette. I wanted to use different shades of yellow as my main colour as I really like the deep thick and earthy yellows you get from taco shells. 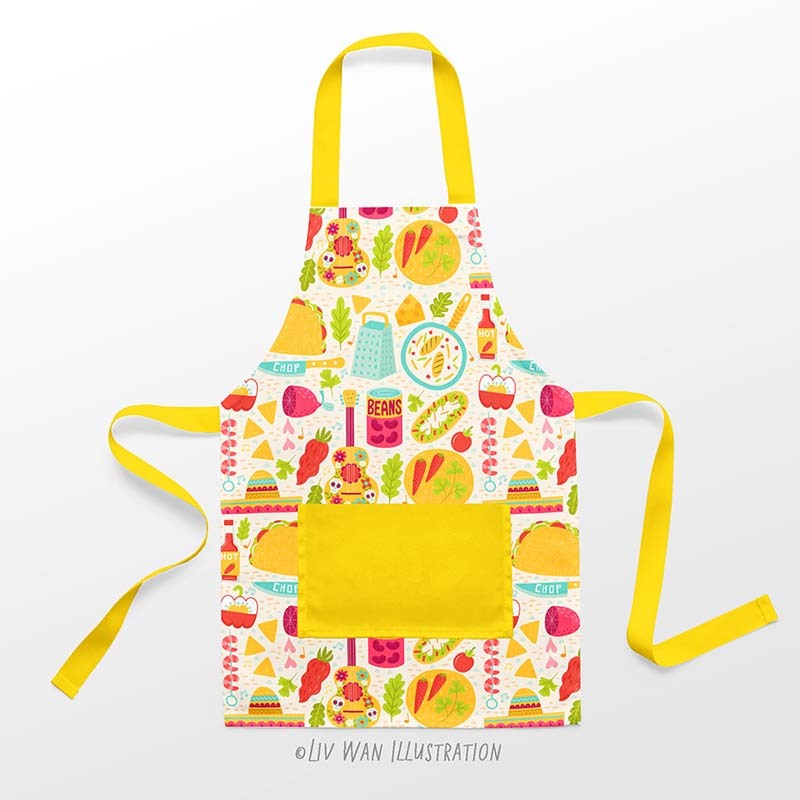 After I created this pattern I thought it would look great on an apron so I bought this apron mockup online and created a few different cute apron mockups with my pattern. The competition result was great! Even though I had some website glitches (my entry didn’t show on their website on the first day of voting) my “I’m a taco kind of gal” came in the top 10 our of 263 entries. Thank you so much to the people who voted for me, I really really appreciate it! Incidentally Spoonflower corrected my problem within 20 minutes of contacting them. Brilliant! I got $20 Spoondollars from Spoonflower and I wanted to print out some wrapping paper with my pattern and use them to wrap my samples and post it to publishers, companies and clients that I’ve always want to work with. I will get on with this very soon! Are you a fan of taco or burrito? I would love to hear your thought!